This time around we have another Matrix/Slitherine game to review, and once again it is based on a John Tiller game. It seems you could throw the proverbial cat and hit one. Just a caveat - I do not endorse cat throwing. Some of the proverbs that have been handed down to us really make me wonder about our ancestors. Campaign ME is a tactical game on the squad or platoon level. It is based upon the Talonsoft game Battleground 10, and it was released in 1997. 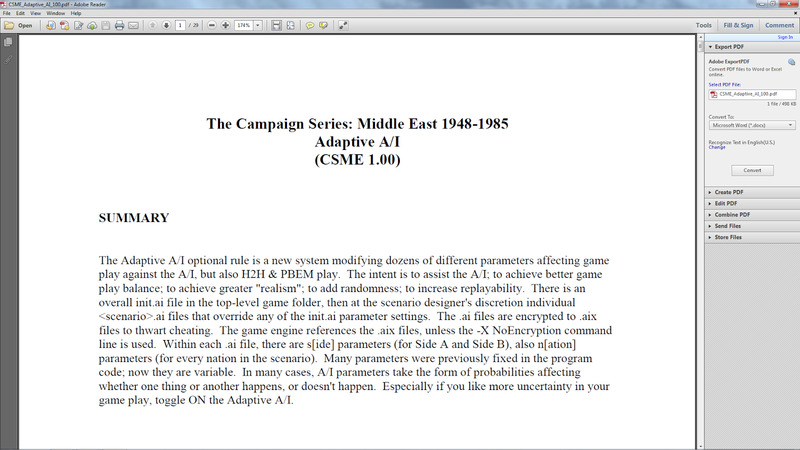 Campaign ME gives us scenarios from 1948 to 1982. The majority of the scenarios involve Israeli forces versus the various Arabic speaking countries around Israel. The middle east during the cold war was a testing ground for various weapons systems of Nato and Warsaw Pact countries. The game allows you to go from WWII weaponry to almost state of the art. To be honest, I have always liked the campaign series of games and have bought every iteration of them. The work that Matrix/Slitherine, and The Campaign Series Legion has done on the various games has only sweetened the deal. There are over 130 historical and hypothetical scenarios. There are also four simplified 'boot camp' scenarios to help get the player up to speed.The game also comes with three linked campaigns. France, United Kingdom, Israel, Egypt, Jordan, Syria, Iraq, Lebanon, Algeria, Libya, Generic Pro-West and Generic Pro-East. Each of these countries have a fully functional Order of Battles, based on historical TO&E's, from Company to Corps level. Combined, there are well over a thousand unique platoons available. Let us first take a look at the game's graphics. For us older Grogs who still or did at one time own the Talonsoft games, they are a sight for sore eyes. I always liked the game play on the older Talonsoft games, but the graphics were never to my taste, and I always had difficulty just looking at the map and distinguishing what each unit depicted really was. You could click on any unit you wanted to check, but this was time consuming, and not something the player should have to do. The game now comes with seven view modes. There are three 3D, and four 2D levels of zoom. 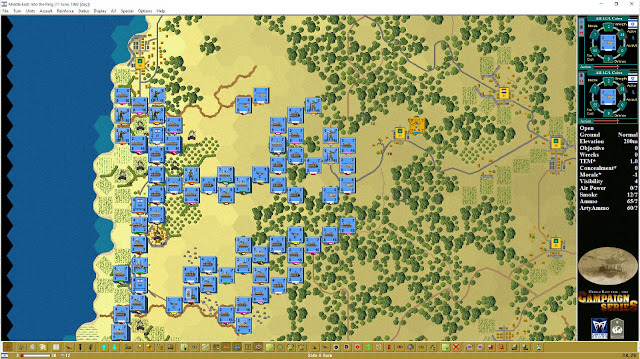 As a solo wargamer I always liked the AI in the Campaign Series games. The Campaign Series Legion has worked hard to enhance the AI even more. They have tried to match the AI behavior to the year, nation, and scenario itself. 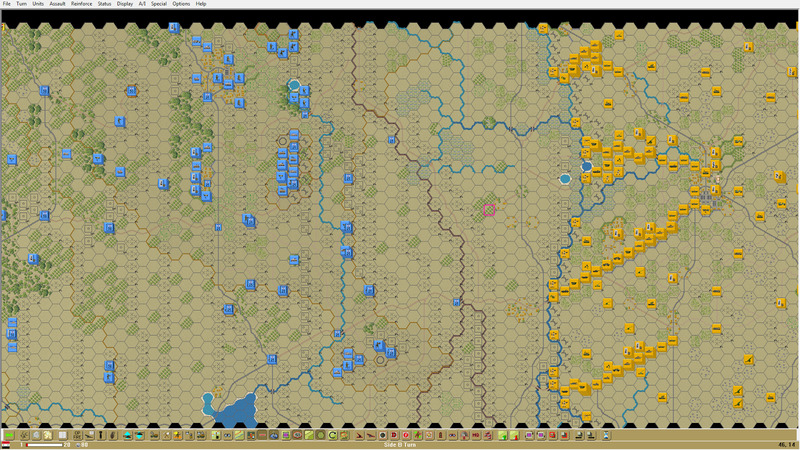 As is the case with most wargame AIs, they do better at defense than in attack. That is not to say that I haven't been caught with my pants down by the AI. The AI's use of artillery in the game was also a strong point for me. 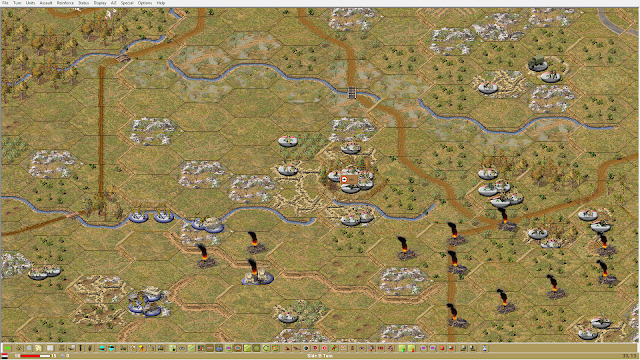 Attacking or defending many times left me with a "what do I do now" look after my silicon troops were scattered after a bombardment. For those of you who like to tinker there are map, battle, and scenario editors. The map editor has forty-nine levels of elevation and no size limit, as long as your computer hardware is up to it. This game shows itself to be a keeper by its vast scale in time and conflicts. Instead of being a game with ten to twenty scenarios of the same battle, you get warfare from WWII to almost modern tanks and weaponry. you have even more to conjure up by using all of the editors. With their use you can match up pretty much any combination of East versus West. There is a 207 page manual (PDF) that comes with the game. It is very inclusive of whatever the player would need to know. 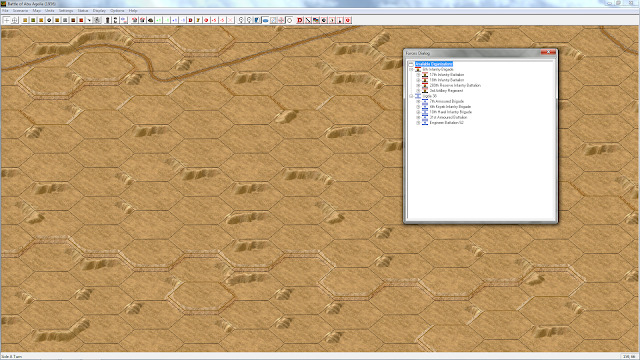 The user interface for the Campaign series has been described as clunky or non-user friendly. 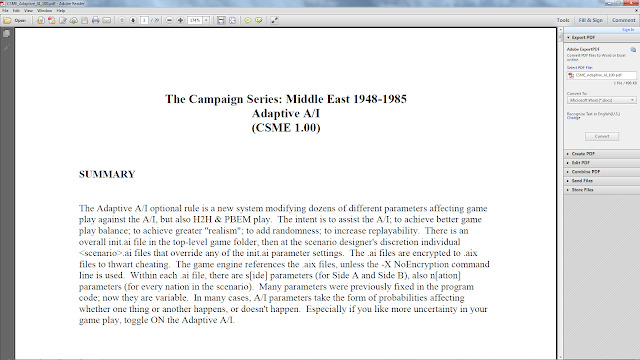 The series was, after all, coded twenty years ago. The newer game's user interface has been streamlined from the older versions.To sum it up Campaign Series Middle East is a good tactical game of the years of warfare it portrays. If you are interested in the progression of warfare from WWII to modern, or are just in a WWII rut then take a look at Campaign Series Middle East 1945-1985. I have been in touch with Jason Petho of the Campaign Series Legion, the developers of the game. In 2017 you can expect a Campaign Middle East 2.0 version. We have included a number of user made modifications that may enhance your gaming experience. It is recommended to use the JSGME Modification Enabler Software that is included as part of the installation. See Section 16.3 for instructions. • Alan R. Arvold Ode To Arab-Israeli Wars – This is a scenario set based on the Arab-Israeli Wars created by Alan R. Arvold. 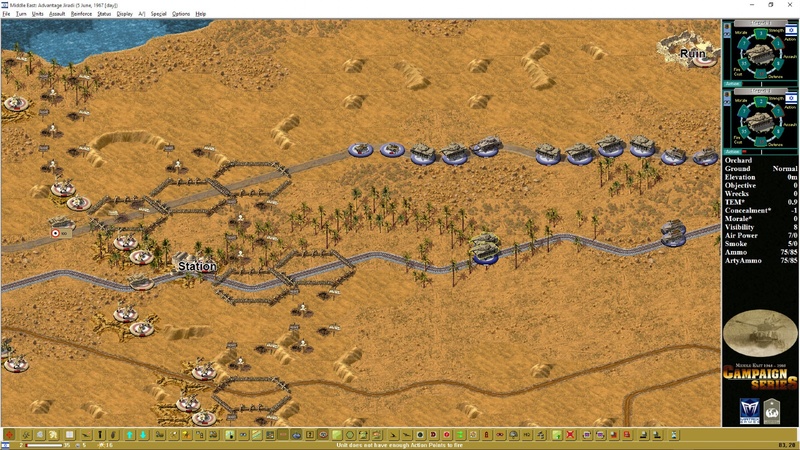 • Ode to Arab-Israeli Wars – This is a 2D graphics modification by Petri Nieminen (aka Crossroads) to provide the players of the Ode to Arab-Israeli Wars scenarios an authentic look and feel when playing the scenarios. 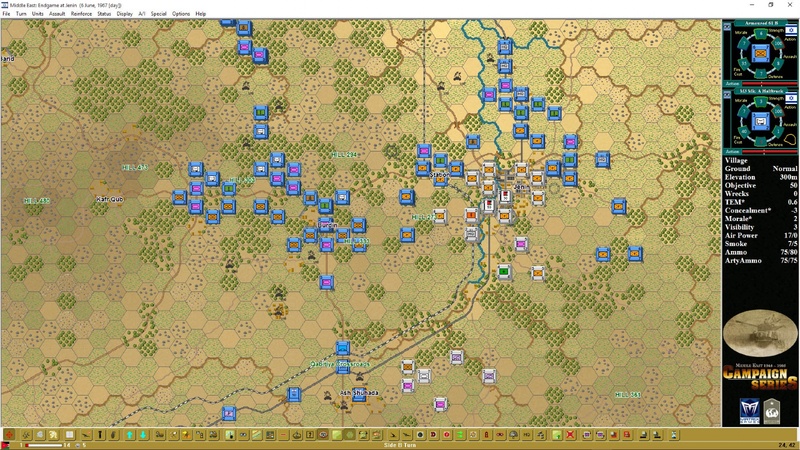 • Alternate 3D Bases – This is a 3D graphics modification that simplifies the roundels in the 3D view, making them easier to distinguish against the terrain. • Black 2D Unit Profiles – This is a 2D graphics modification that converts the coloured unit graphics to black silhouettes. • Black Unit Info Box – This is a UI graphics modification that removes the background information when using the Unit List, making the unit information easier to read. • MausMan 3D Graphics – This is a massive 3D graphics modification that converts all 3D terrain graphics to a smaller scale. • NATO Icons w. Transp. Background – This is a 2D graphics modification for NATO symbols that removes all colour coding and just displays the black outlines. • NATO Icons w. White Background – This is a 2D graphics modification for NATO symbols that replaces all colour coding with a white background. The manual has been revised to 1.02 UPDATE standards. It has also been combed through; revising graphics and grammatical errors, in addition to incorporating comments from users (inclusion of 2D and 3D screenshots, for example). Good article. Looks like a good game. I have been a fan of the Campaign Series since the East Front/West Front days. Nice overview of the latest iteration. I have wanted this for quite some time. Now I want it even more.